Traditional Sikh engagement ceremonies are as colourful as the wedding day. Photographed during the Kurmai (engagement) the bride receives gifts from the groom's family days before the wedding from fine silks, star-studded jewelry and precious stones. This is also when the groom presents the bride with the ring. The ceremony was photographed by Michael Greenberg and Anouk Landry in Surrey, British Columbia. 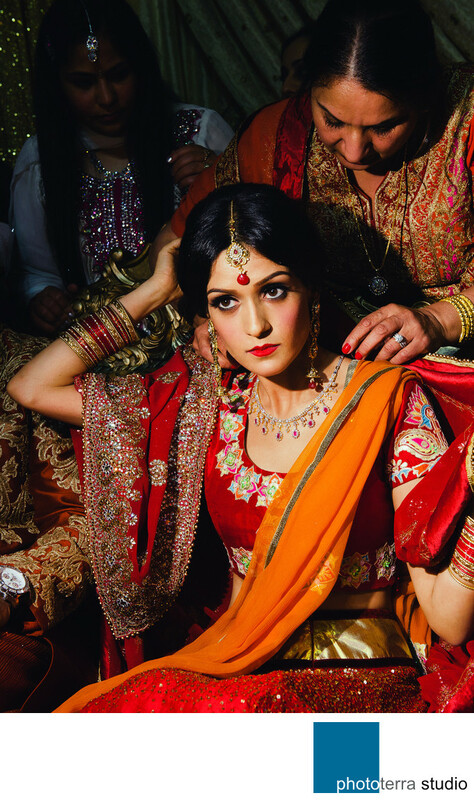 An off-camera flash was used on camera left at a 45-degree angle to emphasis the bride receiving a gold diamond-laced necklace from the groom's mother.